"My husband's grandmother was Chinese. She taught me this one. This is the way Gramma made Sweet and Sour all her life (she died 6 years ago at age 94). The secret is apple cider vinegar." Place cubed pork in a medium bowl, and season with 1 teaspoon salt, 1/4 teaspoon sugar, and 1 teaspoon soy sauce. Mix in the egg white and green onions. Cover, and place in the refrigerator at least 1 hour. Heat 1 quart oil to 365 degrees F (185 degrees C) in a large, heavy saucepan or deep fryer. Coat the pork with 1/2 cup cornstarch, and fry in the heated oil about 10 minutes, until evenly browned. Drain on paper towels. Heat 1 tablespoon oil in a wok over medium heat. Stir in the celery, green bell pepper, and onion, and cook until tender. Season with salt and sugar. Remove from heat, and set aside. In a large saucepan, mix 1 cup water, 1/4 teaspoon salt, 3/4 cup sugar, apple cider vinegar, ketchup, and 1/2 teaspoon soy sauce. Bring to a boil, and stir in the cooked pork, celery mixture, and the pineapple chunks with juice. Return to boil, and mix in 2 tablespoons cornstarch and 1/4 cup water to thicken. Cook until well blended. 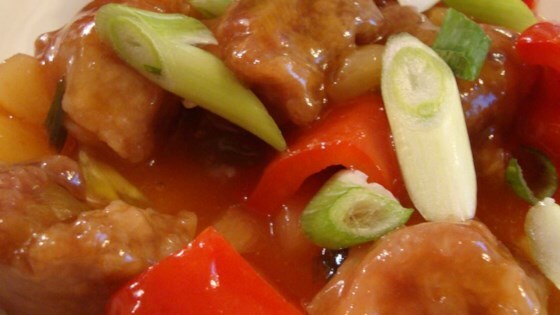 Discover the secrets to making succulent sweet and sour pork.